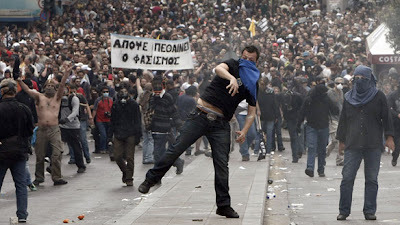 Greece is seeing its worst civil unrest in decades as the government imposed new austerity measures to combat the spiraling financial situation. Greece's crisis is threatening markets around the world. Stock futures fell Wednesday, a day after major indexes posted their biggest losses in months on worries that Europe would not be able to contain Greece's debt problems. 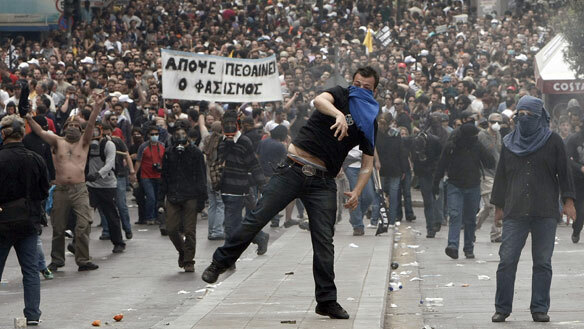 Strict austerity measure drew thousands of protesters onto the streets of Athens, where the demonstrators tried to storm Greece's parliament and hurled paving stones at police. Three people died in a fire set by Greek protesters in central Athens. European markets were mixed as investors remain cautious about whether a $144 billion aid package for Greece will help stem the growing debt crisis. German Chancellor Angela Merkel asked her country's lawmakers to rush the approval of Germany's $29.3 billion share of the Greek rescue program. Stocks plunged around the world Tuesday as fears escalated that Europe might fail to contain Greece's debt problems. The Dow Jones industrial average fell 225 points, its biggest drop in three months. Investors worry that Europe would have trouble bailing out larger countries like Spain and Portugal because the continent's governments spent so much supporting Greece. There are also concerns that the large debt among European nations could upend a global economic recovery. VIDEO: Here is some raw footage of rioting today.